When it comes to blogging, there is one piece of advice that seems to be offered time and again which is “when you talk to everyone, you speak to no one”. In other words, when you blog without focus, direction or a clear understanding of your audience, your efforts never pay off the way you wish they would. Regardless of your training, even the most generalized therapy or coaching practice benefits from having a core niche or market. This is especially true when it comes to digital marketing and content creation. Without a clear focus, you run the risk of writing a little bit across many topics, but never developing a concentration on any one topic. 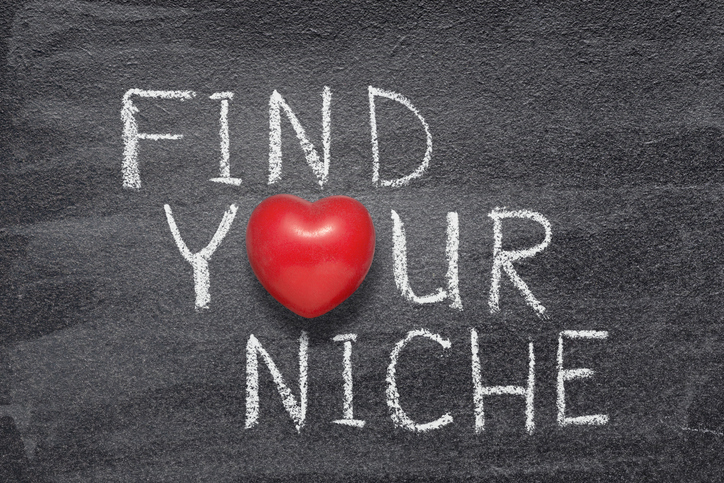 That is where picking a niche comes in, but what’s it all about? Niche and niching is the process of creating a clear focus on your core topics that educate Google and your clients about your authority. Your authority is made of up your credentials, experience, how you offer help, and the kinds of clients you support. Holistically, that is your niche. It is the sum focus of who you help and how you do it. But when you adopt a niche it also means that you’re not trying to do it all. It means you have a clear focus with a limited audience. For generalized therapists or life coaches, the concerns about limiting your audience are at the heart of what pushes some people away from creating their niche. Before you decide if narrowing your focus is a good or bad thing, first learn what you gain by having a clearly defined niche. How Does Knowing Your Niche Help With Content Marketing? You may think that if you don’t pick a niche for your blog, then the world is your oyster. In theory, you can blog about anything under the sun. However, when it comes to blogging it is incumbent on the writer (you) to provide value to the reader. Because if they get to your website and there’s a whole spice drawer of options, it’s hard for them to see you as the legit expert on your topic. And the truth is, as the writer, having too many options can stunt your creativity and bog you down. You may end up with the wrong ideas or thoughts that have potential but are tangential or otherwise not a real issue that the majority of your clients face. You may also struggle deeply with writer’s block when you have too many options available to you. Niching at its core will allow you to define who you’re writing for and why. It also allows you to take ideas off your list that do not serve your core audience and incidentally saves you precious time. Why does this matter? Because in today’s very busy climate it’s not enough to submit one or two articles and have that attract enough business to keep your business flush. If you want to gain traffic from Google that is abundant enough to fill your practice, you have to blog about that topic on a regular basis. Picking a niche also supports your own sanity when it comes to the work you have to do to grow your business. From marketing to workshops, flyers, directories, and other resources you want to be where your clients are. Whether we’re buying a pair of jeans, ordering a cup of coffee, selecting a long-distance carrier, applying to college, choosing a doctor, or setting up a 401(k), everyday decisions–both big and small–have become increasingly complex due to the overwhelming abundance of choice with which we are presented. We assume that more choice means better options and greater satisfaction. But beware of excessive choice: choice overload can make you question the decisions you make before you even make them, it can set you up for unrealistically high expectations, and it can make you blame yourself for any and all failures. In the long run, this can lead to decision-making paralysis, anxiety, and perpetual stress. Essentially when we have fewer options, it’s easier to get into action and make a decision. The thing to remember is that the internet is a big place. There is so much information waiting to be consumed every moment. Readers know this and consequently, they are discerning with their time. Why? Because they are overwhelmed with the paradox of choice too. Once your goals and the topics you plan to write about are aligned, creating content will be easier because your options will be fewer. The net result will be consistently well-written focused content that is beneficial to your goals and your reader’s interest. That is a match made in heaven. By now it should be crystal clear that SEO is crucial to the health and wealth of your business. Remember that Google is continually on the hunt for new content to add to search results. Trust me when I say, that’s a party you want to be invited to. But just like any 1980’s John Hughes movie, you have to prove that you’re worthy. At the end of the day, you must show Google that you provide the type of content that people are looking for. In other words, you must show Google that you write “stuff” that people are actually clicking on and reading. Here is where niching down is incredibly helpful and considerably less time-consuming (for you). When you do your keyword research, you will be able to zero in on the exact words or phrases that are applicable to your niche. You will stop wasting time spinning your wheels with information that won’t attract new clients or benefit your business. Picture this, your reader is looking for information on a very specific topic. They stumble upon your website looking for help. If you do not have the niche defined that connects your reader from their first question to your bigger offers, chances are they will read the one article that brought them in — if you’re lucky — and click out. Most likely they will leave your site in a flash because they did not find any other valuable information. However, if you have a defined niche, that same reader will continue to sift through the wealth of information that is to be found on your website. Knowing your niche allows you to connect with the exact people who are looking for the content you write about. Ideally, your reader will recognize the value of this information, sign up for your newsletter (yes, you need one), ask for a consultation and continually return to your site. It’s no secret that the Internet offers us information on any topic we could possibly think of which means that readers have choices. Lots and lots of choices. If a particular website doesn’t give them the information they need, they can simply move on to the next one and find the information they were looking for elsewhere. However, the website that they will consistently return to is the one that gives them exactly what they want, exactly when they need it. Readers are loyal to sources that consider their time; sources that respect their need for information and insights. They do not want to spend their precious time sorting through the entirety of the world wide web for the little “bit” of information they need. Time is always of the essence and anyone who takes that into consideration wins the day (and the loyal reader). When it comes to building your healing or coaching business the worst thing you can be is a jack of all trades and master of none. Knowing what you’re talking about and establishing trust are the essential cornerstones of your business. If you do not establish that trust built upon your expertise you really have nowhere to go. When you pick a blog niche you essentially force yourself to dig a little deeper on the topics where everyone else just scratches the surface. By doing that research you inevitably become the expert and further solidify your credibility. If an article does not provide the information that a reader is looking for in a concise and easily digestible way, the reader will just a soon click off your page and move on. When you pick a niche, your writing is focused and the message you want to send won’t be muddled. Any readers that find themselves on your website will know that you are a trusted source for the information they want. As you boil it all down, choosing a niche is important for so many reasons. If you find that you are struggling with content creation, you may just need to narrow your focus and dial it down. If you’re unclear about your client’s needs, having a niche will force you to think through your client’s eyes. When you do that well, you will stop wasting time on topics your readers really don’t care about or need help on. Set aside your worries about creating a niche. Think of it in the beginning as an exercise, but one that you can build upon so you save time, money and effort growing and sustaining your business. If really settling on your niche creates heartache or worries for you, it’s worth exploring. When you can back up your hunches about who your audience is with evidence that they are looking for the help, then you KNOW your niche. And that simple exercise is one of the keys to running your business more efficiently and working with clients you really want to help. Not sure how it works? Ask. Please contact us for a free consultation about your niche, blogging strategy, SEO (search engine optimization), content marketing or publishing/creating your book.